It’s that time of year again! The seasons are changing and we’re finally closer to summer here in England! When you’re not off gallivanting along beaches on the hunt for fish and chips, or drinking wine al fresco, you might want to consider a spring clean. Nope, we don’t mean your house. 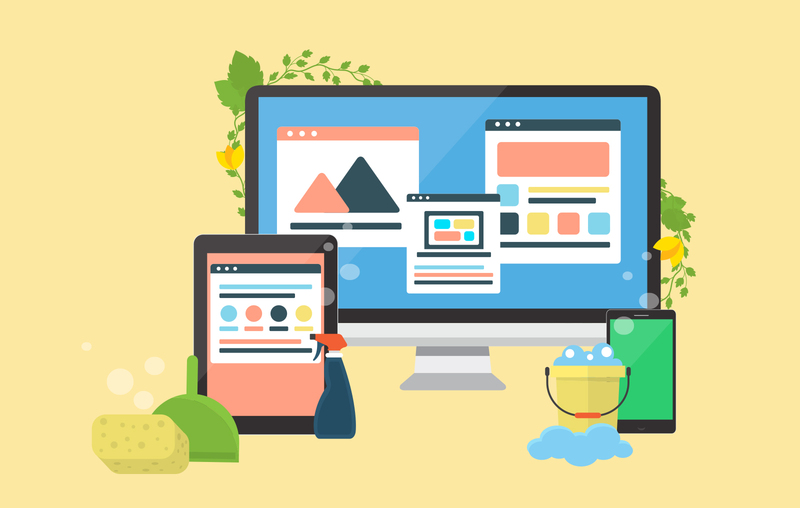 We recommend you think about spring cleaning your online presence. You’ll be amazed how quickly the trends move on and you don’t want your website being left behind. We’ve pulled together our list of top questions to ask yourself, to hopefully help you get started on freshening up your website. 1. Did you consider UX design? Traditionally, web design was all about making the website look good. Over the last year or so it’s morphed slightly and is now more about what design can do to help give your users the best experience. So it’s kind of less about what you think looks nice and more about what the majority of users will find easier to use. Lucky for you this is the kind of thing we like to stay on top of and we have a pretty good idea of what users like, so we’ll try to steer you in the right direction where possible. If not, this is a big one! It’s also one of the easiest ways of ticking the ‘good UX’ box. It’s frustrating when you can’t make a website work properly on your phone, or have to zoom in and out every 10 seconds to read the text on a teeny tiny page. Google now also actively penalises sites which aren’t responsive. Thankfully these days websites which aren’t responsive are becoming few and far between, but if yours is one of the ones which still isn’t responsive then you should really think about a redesign, and soon. 3. Have you got an up to date SSL certificate? Not sure if you have one? Visit your website and check the field with your url in at the top to see if there’s either a padlock or an ‘i’ in a circle. If you have an ‘i’ you do not have a valid SSL certificate. Clicking the icon will tell you a little more about it. You’ll see it also either has http:// or https:// at the start of the url. Google has now released webmaster guidelines which state that sites should be secure and this means purchasing an SSL certificate if you haven’t already. You’d then also need to move to the secure domain and set up redirects for each page. Sound complicated? This is something we can help with too. 4. Have you kept things minimal? Online, people now want simplistic, de-cluttered designs so it’s easier for them to pick out the content that’s relevant and then have the option to clearly drill down for more info. This minimalism extends to menus and navigation too, so give the people what they want and keep it simple! 5. Have you included any nice GIFs, animations and looping videos? This is definitely a current trend for 2017 and keeps things feeling really fresh! Having a little movement on your page is now becoming more mainstream but use it wisely. You’ll need something of excellent quality and less is definitely more here. With anything that moves, a little can be a nice finishing touch, but a lot can be a migraine-inducing distraction from your content! 6. Are you still using stock images? We’ve all gotten too used to seeing the same identikit stock images on website after website. For a real sense of identity that sets you apart you really need to invest in your own (high quality!) photography which actually relates to your company. Use your real products and your real staff and get creative with it. We can recommend some great photographers that we’ve worked with in the past, if you need a little steer in the right direction. 7. What about your very own illustrations? More and more companies are hiring illustrators to create bespoke doodles for their websites. This is something we can help you with too. It can be a great way to inject a little personality and avoid having to use stock images. Also, once you’ve got your style set online, you can use these icons or illustrations for your other media and they’ll reinforce your brand and help ‘spring clean’ across the board. If your hosting isn’t up to scratch this will have an impact on your site, particularly if it’s frustratingly slow. We’ve all bounced back off websites which take too long to load and this is something else which Google penalises sites for. Unreliable hosting may also mean you have more downtime and, if the company aren’t fast on the fixes or difficult to deal with when you do get to speak to them, it might be time to consider a change. We’re partnered with UKFast, one of the most prestigious hosting companies in the UK. We popped down to Manchester to check out their vast set up and meet some of the team and were impressed enough to choose them. We’d be happy to help get you set up too. 9. Has your site had the full SEO treatment? Something we always recommend when launching a new site. Once you’ve spent a lot of time on building your shiny new site, you want people to find it! It might be something you can do yourself, or you might need an SEO pro, but either way it’s worth doing. You’ll want to make sure you’ve cleaned out any dead links, and got any 301 redirects in the right place. Are you using Analytics? Have you got all the keywords in for Google? And if so, have you got the right keywords in or did you just guess them? People commonly use the keywords that they think best apply to their business, without actually confirming that those are the words that their target audience are searching for. For an initial investment this is an element that’s worth getting done properly as you’ll reap the benefits for a long time to come. If you’d like our help with any of the above, or a full overhaul of your online domain, please get in touch.